We are back on RPT1 Ferenc Jozef Barracks. Just so everyone remembers, the Romanian 9th Cavalry were the attackers and the Hungarian 1st Tank Division were the defenders. This engagement was part of the horrendous 100 day siege of Budapest. The Hungarians were fighting along Nazi Germany and the Romanians were Russian allies. 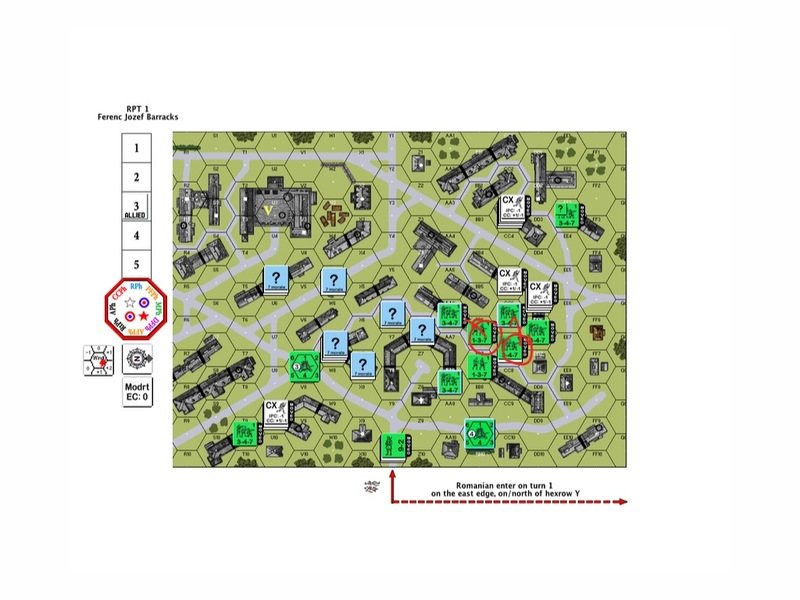 The goal of the scenario is for the Romanians to capture the barracks (marked with a yellow “V” by Don) seen on the top left of the map within a 5 turn (10 mins in real world) time frame . 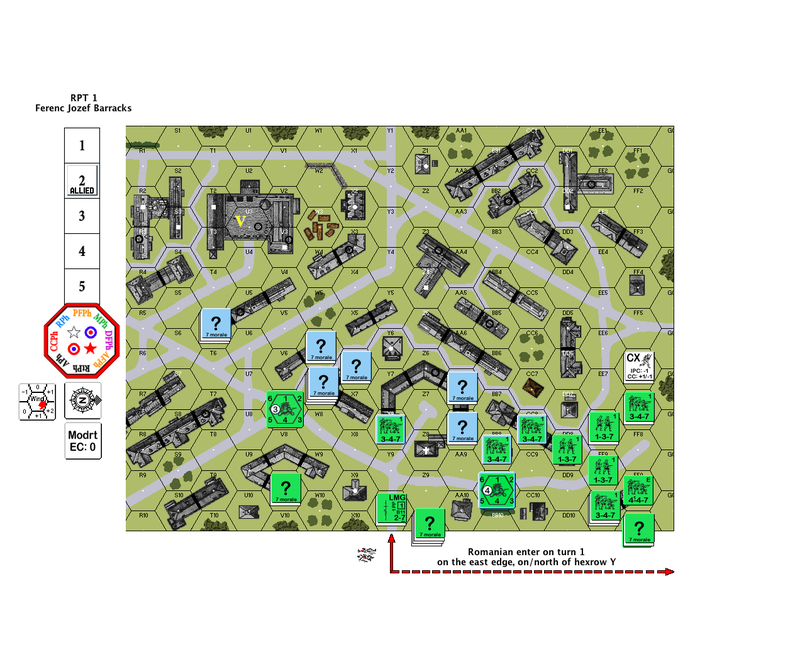 The above was what it looked like at the start of the Hungarian Turn 2. The Hungarians started moving back towards the barracks while keeping their guns pointed to areas where their Romanians pursuers would need to cross. The Romanian 9-2 squad leader hiding all along together with a squad and a shiny new medium machine gun (in the middle on the bottom, circled in orange) decided it was the best time to come out of concealment and open fire at the Hungarians who came into sight. Unfortunately the MMG went the way of the flamethrower and clonked out on the first volley! Apart from making a mental note to launch a complaint against the armoury after the engagement there wasn’t a lot he could do. The other chaps in the building to the bottom right heard the ruckus and joined in as well but they then realised they no longer had line of sight. The Romanians orchestrated a series of moves in the hopes of stopping the bulk of the Hungarians from reaching the barracks. On the righthand side of the map, the Romanians successfully kept the 2 Hungarian squads (circled in yellow) distracted while they double-timed a number of squads up the boulevards to the west. They also intended to engage and even kill a few of the Hungarian squads by hand to hand combat where they could. 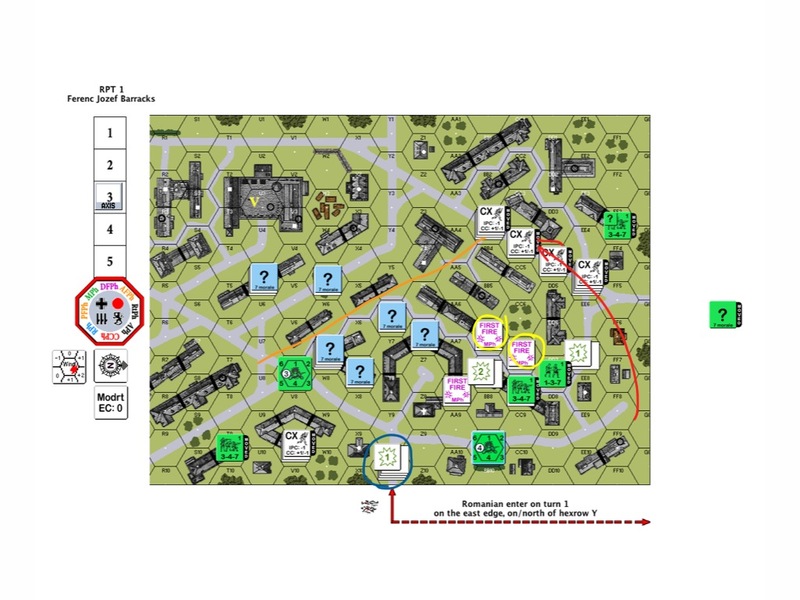 On the bottom of the map, the fuming 9-2 squad leader and his squad (circled in blue) who were dragging their broken MMG across the street (Note to self: use “Dash” next time) got pinned under heavy fire. So there they were, hugging the ground and cursing up a storm in the middle of the street. The orange line through the street on top was where the Romanians planned to shoot at the Hungarians who would need to cross over to the next building on their way to the barracks. The Romanians (circled in red) tried to grab a couple of the escaping Hungarians, but in both instances they were ambushed instead! The Hungarians decided to withdraw and slipped away while the Romanian attackers were still hugging their guns in fright. So here we are at the start of the Hungarian Turn 3. The Romanians have only 2 turns left and the Hungarians has done an elegant job in slipping away intact as a force while mostly staying under concealment. Will the Romanians catch up to the Hungarian masters of defence? Keep an eye out for Part 4 of RPT Ferenc Jozef Barracks! 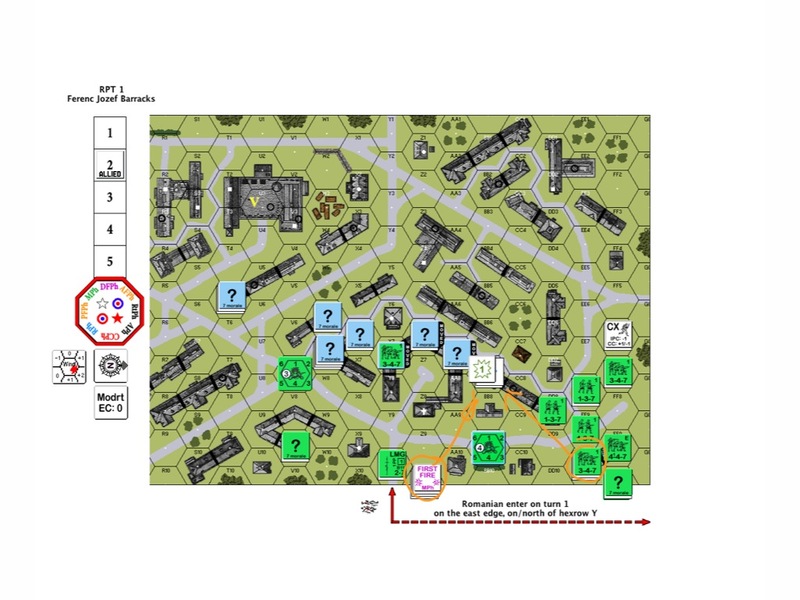 This entry was posted in Game Play and tagged AAR, Advanced Squad Leader, ASL, Board Game, board wargame, Budapest, gaming, Nazi Germany, PBEM, Scenario, Siege of Budapest, VASL, wargame. Bookmark the permalink. Solid defence against you. Defences like that want to function like an airbag. As you push into it it collapses back to the protection point increasing in strength as it goes. Unless you have overwhelming forces on your side it would be difficult to overcome by ‘blanketing’ it. Instead traditional Schwerpunkt tactics work well with one thrust (like a knife) ignoring the rest of the bag. The collapsing airbag! That’s a great analogy. I was watching and trying to learn as much as I can from my esteemed opponent here. I ran a string of squads up the street on the top of the map in my attempt to upset the balance but my guys were too spread out, you are right. Traditional Schwerpunkt would work better, next time!